Mark Goff was born on the 11th of April 1886 in Dorking Surrey and he was baptized on the 8th of May 1886 at St Martin’s church in Dorking Surrey. At the time of baptism the young family lived at Cotmandene Square in Dorking Surrey. Mark’s father worked as a labourer. Mark’s mother was called Emily/ Maria Goff nee Peters and she was born in the 3rd quarter of 1852 in Dorking Surrey. Emily’s parents and Mark’s grandparents were called Joseph (born about 1824 in Dorking Surrey) and Maria (born about 1825 in Dorking Surrey) Peters. Joseph was working as an agricultural labourer. Emily died in March 1918 in Dorking Surrey. She was 65 years old. Emily and Mark married in the 2nd quarter of 1870 in Dorking Surrey. Emily was already pregnant with Emily Maria. Emily and Mark had 15 children. 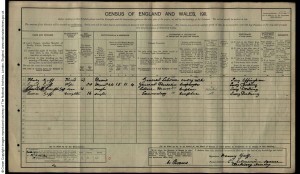 Eleven were still alive at the time of the 1911 Census. Edward James Goff, Esther Goff and the twins Lucy and George Goff died as infants. Emily Maria Goff born in 1870 in Dorking Surrey and baptized on the 28th of August 1870 in Dorking Surrey. Ann Goff born on the 16th of February 1872 in Dorking Surrey and baptized on the 31st of March 1872 at St Paul’s in Dorking Surrey. Rachel Goff born in the 1st quarter of 1874 in Reigate Surrey. Henry Butler Goff born in 1875 in Reigate Surrey and baptized on the 1st of August 1875 in Reigate District of St John Redhill. Eleanor Kate Goff born in 1877 in Dorking Surrey and baptised on the 12th of August 1877 at St Martin’s church in Dorking Surrey. Fanny Sarah Goff born in 1879 in Dorking Surrey and baptized on the 7th of December 1879 at St Martin’s church in Dorking Surrey. Edward James Goff baptized on the 26th of June 1881 at St Martin’s church in Dorking Surrey. Esther Goff baptized on the 9th of October 1882 at St Martin’s church in Dorking Surrey. Martha Caroline Goff born in 1884 in Dorking Surrey and baptized on the 30th of March 1884 at St Martin’s church in Dorking Surrey. twins Lucy and George Goff born on the 27th of September 1888 and baptised on the 26th of October 1888 in Dorking Surrey. Charles Joseph Goff born on the 8th of November 1889 in Dorking Surrey and baptized on the 5th of January 1890 at St Martin’s church in Dorking Surrey. Eliza Goff born on the 6th of January 1893 in Dorking Surrey and baptized on the 19th of March 1893 at St Martin’s church in Dorking Surrey. Emma Goff born on the 27th of October 1894 in Dorking Surrey and baptized on the 30th of December 1894 at St Martin’s church in Dorking Surrey. 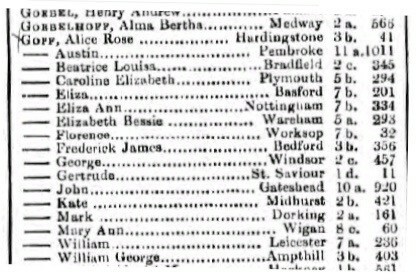 1871 Census reads that newlywed’s Emily and Henry, together with daughter Emily Maria, lived with their relatives John and Ann Lucas at Falkland Road in Dorking Surrey. Henry worked as a labourer. 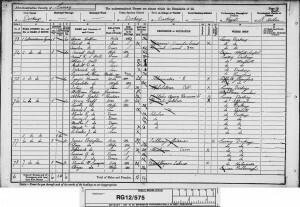 1881 Census reads that the ever growing family moved to Jupps Cottages (Cotmandene) in Dorking Surrey. Henry still worked as a general labourer. 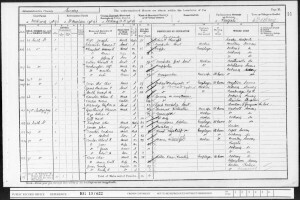 1891 Census reads that the family lived at Cotmandene Square in Dorking Surrey. Mark was 5 years old. Henry worked as a general labourer. 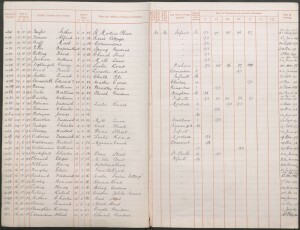 School Admission Register reads that Mark was admitted on the 17th of October 1892 to St Martin’s Church of England School in Dorking for Boys. The family lived at Cotmandene Square in Dorking Surrey. Mark previously attended St Martin’s Church of England School in Dorking for Infants. 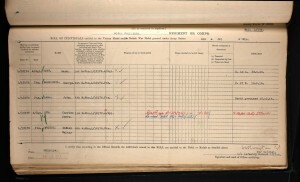 He left the school on the 30th of September 1898. 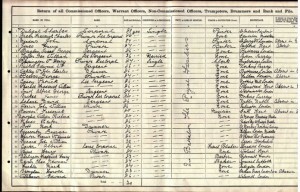 By the 1901 Census Mark left home and worked as a pot boy at the Spotted Dog public house on South Street in Dorking. The rest of the family continued to live at No. 4 Cotmandene Square in Dorking. 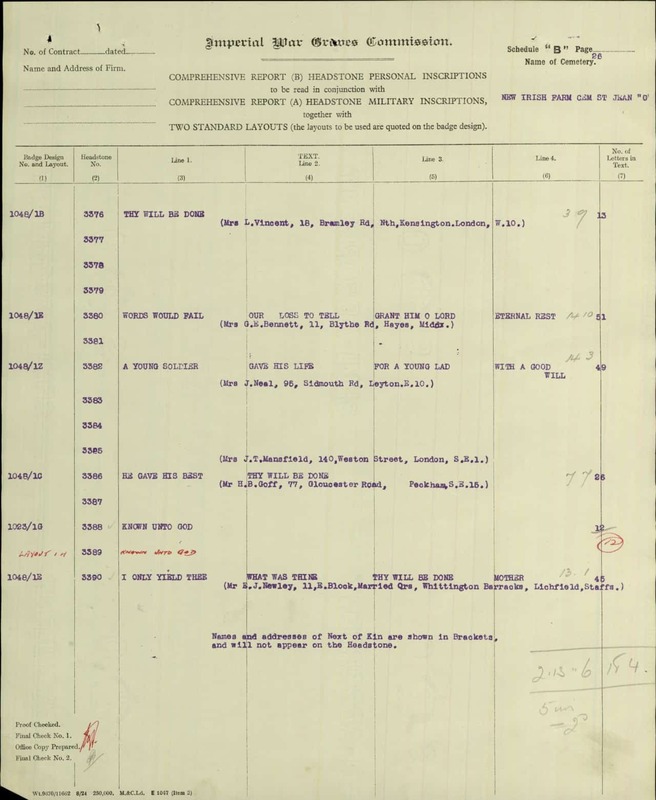 At the time of the 1911 Census Mark was stationed in India as part of the 2nd Battalion The Royal Fusilier Regiment. He was single and did not learn any trade. 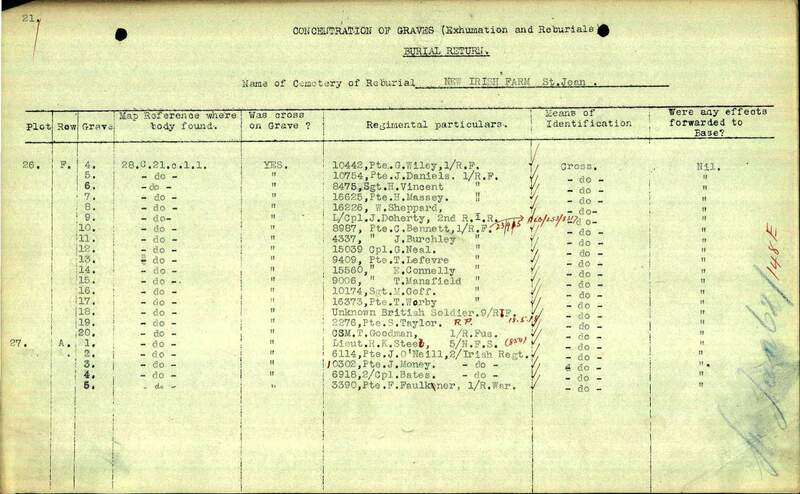 As mentioned above, by the time of the 1911 Census, Mark Goff had joined the army. In 1911 he was in India as part of the 2nd Battalion The Royal Fusiliers Regiment. He was a drummer. 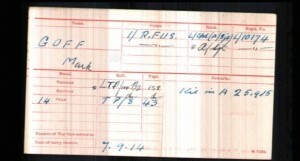 At 1914 Mark was serving with the 1st Battalion the Royal Fusiliers City of London Regiment. His regimental number was L/10174 and he had the rank of a Lance Corporal and an Acting Sergeant. Mark enlisted in Aldershot and resided in Dorking Surrey. He entered the Western Theatre of War on the 7th of September 1914. The 1st Battalion was stationed at the outbreak of the war at Kinsale, Mulster as part of the 17th Brigade of the 6th Division. In September 1914 the 1st Battalion landed at St Nazaire, France. The Battalion supported the BEF in the action on the Aisne heights in 1914 and in 1915 the Battalion moved north to Flanders and took part in action at Hooge. 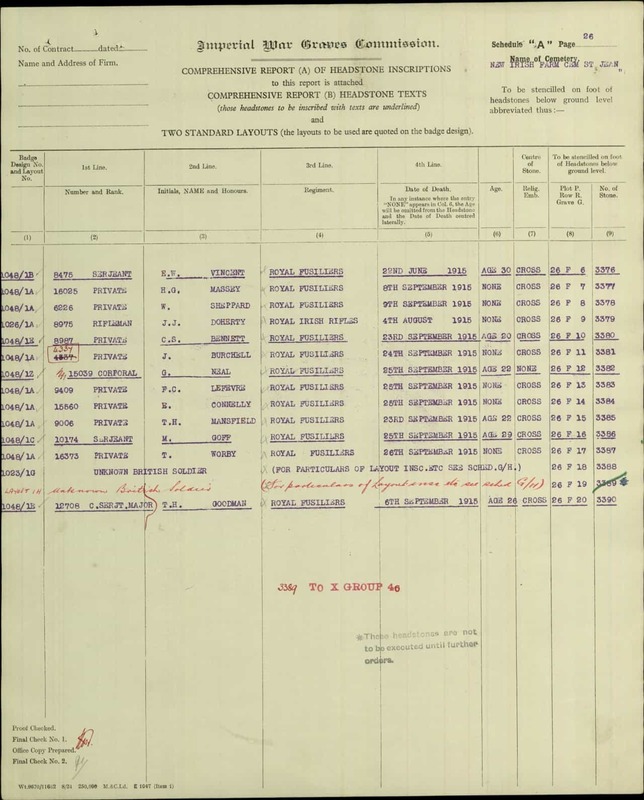 Mark was killed in Flanders on the 25th of September 1915 – possibly by a shell. 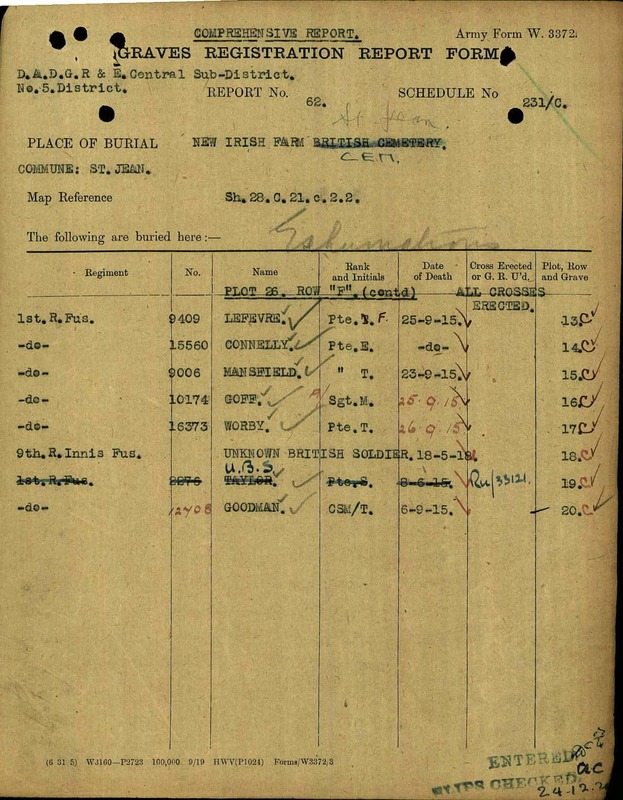 He is buried at the New Irish Farm Cemetery situated near a farm which soldiers called the Irish Farm in Belgium. His body was reburied at the New Irish Farm Cemetery, from a smaller original Irish Farm Cemetery ‘St Jean’, south of the farm. He was identified there by a cross. This small cemetery was built by the 1st Battalion Royal Fusiliers in May 1915. They were burying their dead there until September 1915. After his reburial at the New Irish Farm Cemetery, Mark had a cross erected and a citation inscribed upon it that reads “He gave his best” “Thy will be done”, by his oldest brother Henry Butler Goff of 77 Gloucester Road Peckham. His grave reference is XXVL. F. 16. He received the Victory and British medals and the 1914 Star. Mark was 29 years old.